1) I don’t want to be the boy who cried wolf when it comes to the ever-imminent return of the East Bay’s perennial Sichuan favorite, China Village (1335 Solano Ave.) — closed for over a year now after a kitchen blaze put the restaurant out of commission. Nevertheless, I’d be remiss if I didn’t pass along this latest update: According to a report from Chowhound poster Melanie Wong, the restaurant is finally on the verge of reopening, with only PG&E to wait on. The new ETA is the beginning of May, and diners who are mindful of the provenance and quality of ingredients will be happy to note that organic chicken dishes will be available on the specials board. 2) Speaking of fire-necessitated remodels, Inside Scoop’s latest update on Chez Panisse notes the restaurant’s new targeted reopening date: June 10. It sounds like construction work is going full speed ahead, especially now that a custom 25-foot steel frame has been installed as a support structure for the entire restaurant. According to Inside Scoop, this marks the first time that metal has been used in the restaurant’s frame. 3) Grubstreet reports that Oakland’s Sorella di Zza’s (550-552 Grand Ave.), has been purchased by Philip Raskin of http://www.filippos.biz/, an Italian restaurant with locations in Rockridge and Berkeley’s Elmwood district. For now, Zza’s remains unchanged, but eventually it will morph into Bar Lago Italian Kitchen and feature a full bar. 4) On the other side of the Caldecott Tunnel, Ike’s new Walnut Creek location (1159 Locust St.) is now open, according to Diablo Dish. In related news, some dude in Walnut Creek just ate one of Ike’s infamous Kryptonite sandwiches — that thirteen-ingredient, four-pound behemoth of Man vs. Food fame — in a record-breaking 8 minutes 34 seconds. 5) Some news on the highly underrepresented (in the Bay Area) Eastern European food front: Sadly, Eater SF notes that Satellite Republic, the Georgian pop-up/moped-powered food cart, is closing up shop, as owner Boris Portnoy is moving to Australia. Portnoy hosted his final pop-up at Uptown Oakland’s The Punchdown (2212 Broadway) last Friday. On a happier note, Grubstreet reports that a Lithuanian restaurant called Mama Papa Lithuania is coming to 1241 Park St. in Alameda. 6) Berkeleyside notes the opening of East Bay Spice Company, a new cocktail-focused Indian restaurant at 2134 Oxford St. in Berkeley. Deepak Aggarwal (who also owns Mint Leaf in the Gourmet Ghetto) has revamped his former buffet restaurant in that space, Punjabi By Nature, with a North Indian street food inspired menu and a beverage program that was developed by Adam Stemmler of the San Diego-based Blind Tiger Cocktail Co. and Eric Quilty of Oakland's Jupiter Olympus. 7) Starting next week, Victory Burger (1099 Alcatraz Ave.) will be open on Mondays from 11:30 a.m. to 9 p.m. 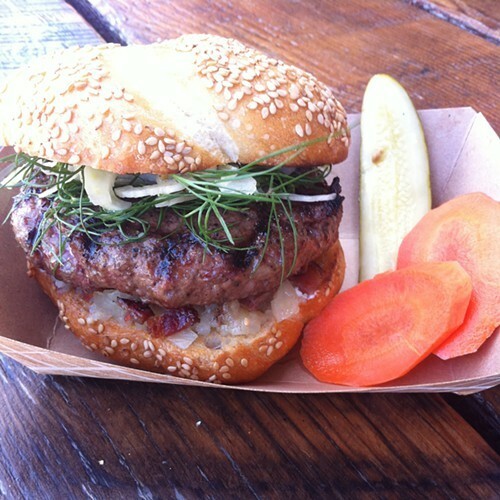 The North Oakland burger joint is now open for lunch and dinner six days a week (every day except Tuesday). In addition, the entire Victory Burger menu will now be available at the adjacent Actual Cafe, which has a beer and wine license. During the month of May, the cafe will be running a $10 burger-and-beer dinner special all six nights of the week that Victory Burger is open. 8) Oliveto (5655 College Ave., Oakland) will be hosting a series of Bird Dinners next week, Tuesday, May 7 through Friday, May 10. The à la carte menu will focus on different preparations of local game birds — buttermilk-fried quail, a terrina of pigeon, seared duck liver, and more. Check out the full menu here. 9) Berkeleyside Nosh was on hand to document a friendly latte art competition at Awaken Cafe, and profiled the event’s organizer, Bay Area Coffee Community — a recently founded “collection of coffee professionals and enthusiasts.” And, in other food-related competition news, East Bay Dish reports has a preview of the SF Bay Chili Cookoff, which will take place in Oakland this Saturday, from 1 p.m.-4 p.m. at the Classic Cars West beer garden (411 26th St.). The $15 admission includes a beer and a taste of all of the chili entries. 10) Finally, ICYMI, Fruitvale’s new urban farm store is having its grand opening this weekend, and Jon Kosorek (of the gourmet food truck OG Jon’s Street Eats) opened his new brick-and-mortar restaurant, Marrow (325 19th St.), last week.